Nail Art. Swatches and Reviews. Honest love of nail polish and all things beauty. Good morning! Hope you enjoyed your week! Today I'm sharing a fun trio that releases tomorrow! So many releases tomorrow, so save your Friday payday money haha. This trio is a mix of a holo flake shimmer, complex shimmer, and a matte shimmer. It's a nice combination of colors, so let's look at it! I have to admit, all these horror-inspired Polish Pickups, and I have no clue about them! I think it's cool because horror movies are a genre that has tons of independent makers. I have to say I only know the super popular ones. But Fiendish Fancies entire brand is based off of the horror genre, so I bet she loved this theme! I have the six other colors of the Bee's Knees Lacquer Anniversary collection today! I shared Part I yesterday which included 4 magnetic multichromes and 2 flake polishes. Today, I'm sharing some OG Unicorn Pee polishes and multichromes. I think you will enjoy this set! All the details are in my post! So check it out. Hello! Today I have part one of the Bee's Knees Lacquer Anniversary collection! All 12 polishes have fun shifts and coloring, so I really didn't want to overload you with 75 photos! Hahaha. So this collection is a re-release from their first collection, the IT collection! Although I don't own the originals, Bee's Knees says these are very close! Along with this re-release there are some new colors, and some OG Unicorn Pee colors. Ok, let's get to these! So apparently I don't watch as many horror movies as I thought, because many of the Polish Pickups are based on movies I haven't seen. No big deal, because I'm creating a list of movies to watch! I've watched a lot of zombie/undead movies since I teach a class on undead literature, so I feel like whhaatt that I haven't seen Constantine, which inspired this KBShimmer. More loose pigments today! I love them and the different effects, so I just don't get sick of them! While I was swatching Morgan Taylor's fall collection, I realized there were perfect base colors for these flakes, and I was right. I love the chrome effect of this pigment, so let's see all the surprising shifts! Pusheen is sooo lazy for August, and I feel that! It's been super humid, horribly raining, and I've been prepping for my semester which starts officially next week, but I've actually been on campus this week for other school stuffs. It's always hard getting back into the groove of teaching. But I have to admit, I can't wait to go back! I know I've been so swatch heavy lately, and that will continue as I make my way through collections and items. I do, however, want to squeeze in at least 1 art a week! Today, I originally planned on doing a manicure to match a dress I have, but it was not going as planned. I took a step back and decided to go with simple and neon. I know fall is coming, so I was to do a few more neon manicures before I do all things pumpkin and leaves! Every time I get one of these loose flakie/glitter/chrome powders, I'm like can I be wowed again? The answer is yes, very much yes. I luuurrrrvvve these flakes and can't get enough, and this aurora chameleon flake is truly amazing! I'm here today with my first fall collection! To be honest, these showed up a while ago, but I was desperate to put off posting Fall stuff until we were a bit closer. That, and I still had lots of stuff for summer yet! As I stare at 3 other fall collections, I'm excited to share Morgan Taylor's African Safari collection! Last year's fall collection didn't wow me, so I was glad to see something I enjoyed! I was awaiting a swatch package, but I didn't want to leave my nails bare. I find I have the dumbest breaks when I have no polish on. So I pulled out one of my purchases from Indie Expo Canada. When I saw previews of this polish, I knew I wanted to stop by the booth and check it out. Well, it won me over and came home with me! Girly Bits keeps making polishes that make me shed a tear because they are so beautiful. I thought the July CotM was amazing and couldn't be beat, but then August was like whatttt here I am? And all I can say is that you are going to want both sets. This set is like hidden rainbows of fun on your nails! There was no way I could swatch the Turtle Tootsie Pet Peeve collection and NOT do art! The dusty, 70s vibes of these cremes won me over. Plus, it was a rainbow palette. These things equal epic dotticure to me. Ok, this may not be epic to you, but it came out exactly as I planned. For me, that is a big deal! When I hosted a tutorial table at Indie Expo Canada, many brands donated their products after to those who hosted. As I watched people grab all the holos, I really went for liquid latex and top coats. I mean, I go through those the most! As a self-taught nail artist, I gravitate toward cremes for crisp nail art. I saw these dusty cremes out of the corner of my eye, and said hello to mama. Call me crazy but I love a good crème over a holo. This also is my first real experience with Turtle Tootsie Polish (beyond the mini in the Indie Expo VIP bag), so I think this was a great first start! Another month, another glorious colour of the month duo from Girly Bits. I'll actually be showcasing two this week, as both are available until September 1! This duo features a super shifty magnetic polish and a super blingy sparkler, so let's check them out! Queen in the North is the next installment for Stella Chroma's women of Game of Thrones. This is a tribute to Talisa Stark and based on the pictures I have seen of her, I have to admit, this polish looks like something she would wear! Her hair is long and deep colored, her outfits are grey. I just GET her in this polish! Have you heard about the new Indie Pickup? Due to the success of Polish Pickup, they've now broken up the majority of the non-nail polish products and created Indie Pickup. Indie Pickup will host jewelry, bath and body products, makeup, and more. 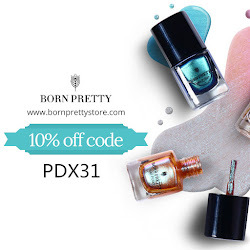 The sale will be the third weekend, while the nail polish with still be the first weekend. The themes will be the same! Alter Ego will share her bath crumbs for the inaugural Indie Pickup. I've shared her bath crumbs here before, so I'm excited to share them again! Happy Friday! I'm really feeling the end of summer, eek! I still have so much I want to do. I feel like these special sale weekends make time pass so fast! Anywho, I'm here with the Girly Bits Hella Handmade Creations. Her theme is Harry Potter and this is based on merpeople. I don't think I've seen the movie with these merpeople, but I LOVE their color! I have been wanting to do some sort of fruit art with the Stella Chroma Summer Diversions collection since I have swatched it. Yes, two months LOL. Ridiculous. Then I was sort of glad I waited because this awesome plate from Beauty Big Bang arrived and it was a match made in heaven. Today I have three polishes from the newest multichrome magnetic collection from Paint It Pretty. I first tried this brand from the Indie Expo VIP bag, so I was looking forward to testing out more. Magnetic polishes are all the rage, so this collection is continuing on trend! Bridal season may be in full gear (I feel like everyone gets married in August. Why?! It's so hot! But Happy Anniversary to my brother and sister-in-law who got married on August 10). So I'm sharing this creamy Bridal Collection from Girly Bits! The good news is that these cremes do double duty. Not only are they gorgeous, but they are all stamp! KBShimmer is celebrating ten years in business, and to celebrate that, they are releasing a throwback collection with polishes from 2012 and 2013. If you search my blog, many of these are actually on it from 2012. I won't link them, because they are embarrassing since it was my first year blogging haha. But I'm happy to have these back in my collection, now improved with a better formula! But honestly, these polishes are the same, if not very close to the originals! I mentioned in my Zoya Jelly Brites post that I had done a jelly sandwich, so here I am! I remember when jelly sandwiches were all the rage! It's when you take a glitter and layer it between a jelly polish! I saw this fireworks glitter from Beauty Big Bang and figured now is the time to do a jelly sandwich! This beauty took a trip and landed on my doorstep yesterday at 5pm! So glad I was able to swatch it on time and share it since it's only available through August 6th. Polish Pickup is musical themed this month, and Girly Bits went with Fame. I haven't actually seen this, but I've heard many references to it in Gilmore Girls haha. I'm catching up on some Indie Expo Canada press gifts and this one from My Indie Polish deserved some attention. Thank goodness it was labeled as a thermal, because I had no idea! I always love the surprise of what color the thermal shift to! This is also my first polish with My Indie Polish, so let's get to it! Alter Ego has now started a monthly custom group polish, so each month you can grab a very special limited polish. Last month was Champagne Taste, Beer Budget which was gorgeous (and there's a few left!) and this month, Space Octopus is amazing!!! I cannot believe it is August already. LIKE WHAT?! I spent June on back to back road trips, so it was a blur. Came home from my trip and broke my foot that night! So I spent July nursing it basically haha and now it's August. This means my semester starts so soon, so I need to get my syllabi ready! Plus, I have like 20 more things I want to do before summer ends. Anywho, Zoya Element for the Fall landed on my doorstep last week, so I figured I needed to show you the Jelly Brites that released last month! So let's get to this trio! Beauty blogger with a focus on nail polish, nail art, and beauty! 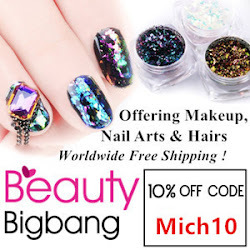 My focus is on nail art, both easy and difficult to achieve and to share the latest in the nail polish and beauty world!